Hikers on the West Coast Trail, Vancouver Island, British Columbia, Canada. Karri forest along Bibbulmun Track south of Pemberton, Western Australia. A long-distance trail (or long-distance footpath, track, way, greenway) is a longer recreational trail mainly through rural areas used for hiking, backpacking, cycling, horse riding or cross-country skiing. They exist on all continents except Antartica. Many trails are marked on maps. Typically, a long-distance route will be at least 50 km (30 mi) long, but many run for several hundred miles, or longer. Many routes are waymarked and may cross public or private land and/or follow existing rights of way. Generally, the surface is not specially prepared, and there are often rough ground and uneven areas, except in places such as converted rail tracks or popular walking routes where stone-pitching and slabs have been laid to prevent erosion. In some places, official trails will have the surface specially prepared to make the going easier. GR footpaths are long-distance footpaths in France, Belgium, the Netherlands, Spain and Portugal (the Grande Randonnée (French), Grote Routepaden or Lange-afstand-wandelpaden (Dutch), Grande Rota (Portuguese) or Gran Recorrido (Spanish)). National Trails are a network of officially sanctioned footpaths in the United Kingdom which are well maintained and well waymarked across England and Wales. Examples are the Pennine Way and the South West Coast Path. The equivalent routes in Scotland are styled as Scotland's Great Trails; they include the West Highland Way and the Speyside Way. The Kerry Way in south-west Ireland circumnavigates the highest mountain range in Ireland. Along with the adjoining Dingle Way it is noted for its scenic views of the Atlantic, loughs and mountains. A view from the Hungarian National Blue Trail, a national trail, incorporated into the European Long Distance Walking Route E4. These follow coastlines; examples are the Brittany Coast Path in France, the California Coastal Trail in the US, the South West Coast Path in England, the East Coast Trail in Canada, and the Otter Trail in South Africa. The England Coast Path, in development by Natural England, will be around 2,700 miles (4,350 km) long in 2020 making it the longest coastal walking route in the world and Britain's longest National Trail. These may be cross-country paths, or may follow roads or other ways, and often intersect with many other trails. Example are Wainwright's Coast-to-Coast path in northern England, and the GR 10 in France. The English Coast to Coast route, despite being amongst the best-known long-distance walking routes in England, is not an official National Trail but simply a series of connected pre-existing rights of way, roads and open country with some informal links between them. There is also a coast-to-coast mountain-bike route in northern England that has the same trailheads as the walkers' path. GR 10 is a French GR footpath that runs the length of the Pyrenees Mountains, roughly paralleling the French–Spanish border on the French side. It runs west to east, from Hendaye on the Bay of Biscay to Banyuls-sur-Mer on the Mediterranean Sea. The American Discovery Trail is a hiking and biking trail that crosses the continental United States from east to west. across the mid-tier of the United States. Horses can also be ridden on most of this trail. It starts on the Delmarva Peninsula on the Atlantic Ocean and ends on the northern California coast on the Pacific Ocean. The Iditarod Trail connects the coastal cities of Seward and Nome, Alaska: a distance of around 1,000 miles. 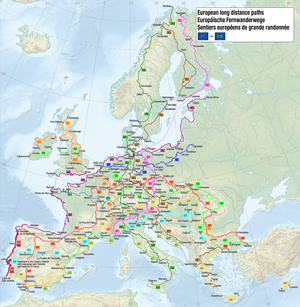 The European long-distance paths (E-paths) traverse Europe, passing through many different countries. Among the longest are European walking route E8 and the Iron Curtain Trail (also known as EuroVelo 13). The latter is a partially complete long-distance cycling route which will run along the entire length of the former Iron Curtain. During the period of the Cold War (c. 1947–1991), the Iron Curtain delineated the border between the Communist East and the capitalist West. E8 runs 4,700 km (2,920 miles) across Europe, from Cork in Ireland to Istanbul in Turkey. Proposed trail (8,500 kilometres (5,300 mi) when finished): Chilean path – Chile. Long-distance mountain trails are of two broad kinds: linear trails and loop trails. In Europe the Via Alpina consists of five connected hiking trails across the alpine regions of Slovenia, Austria, Germany, Liechtenstein, Switzerland, Italy, France and Monaco. It is 5,000 km (3,100 miles) long, with 342 day stages. Circular routes include the Tour du Mont Blanc, which passes through the Alps of France, Switzerland, and Italy. In the Balkans region the Peaks of the Balkans Trail and High Scardus Trail connect Albania, Kosovo and Montenegro or North Macedonia respectively through a network of combined almost 700 kilometres (430 mi). In the United States notable linear trails include the Appalachian Trail, the Pacific Crest Trail and the Continental Divide Trail. The first long-distance hiking trail in the US was begun in 1910 and named The Long Trail. Notable circular trails include the Tahoe Rim Trail and the Wonderland Trail (which encircles Mount Rainier). The Australian Alps Walking Track traverses the alpine areas of Victoria, New South Wales and the Australian Capital Territory. It is 655 km (407 miles) long, starting at Walhalla, Victoria, and running through to Tharwa, Australian Capital Territory near Canberra. The Himalayan routes are famous for attracting a large number of trekkers (backpackers). Typical trekking regions in Nepal are Annapurna, Dolpo, Langtang, Manaslu, Kangchenjunga and Mount Everest. In India, the Kashmir Valley is home to several trekking routes that traverse western sections of the Himalayas. Vishansar Lake, Gangabal Lake and Tarsar Lakes are accessible only through different trekking routes. Other popular trekking routes in India include Chandra Taal, Dzongri, Goechala, Gomukh, Hemkund, Kafni Glacier, Kailash-Manasarovar, Kedarnath, Kedartal, Milam Glacier, Nanda Devi Sanctuary, Pindari Glacier, Richenpong, Roopkund, Sar Pass, Satopanth Tal, Saurkundi Pass and the Valley of Flowers. The Great Himalaya Trail is proposed to follow the Greater Himalaya Range from Namche Barwa in Tibet to Nanga Parbat in Pakistan, forming the world's highest mountain trail. A long-distance trail in the Andes, the 13,000-kilometre (8,100 mi) Greater Patagonian Trail, was first described in 2014. It explores the remote areas of the Patagonian Andes in the border region between Chile and Argentina. These have been constructed mainly for bicycle touring. Some are restricted to use by only non-motorized bikes while others are multi-use recreational (i.e. hiking, horseback riding, jogging, rollerblading or walking). Some long-distance cycling routes are hundreds of miles long, such as Australia's mainly off-road Munda Biddi Trail, or even thousands of miles, such as the EuroVelo routes. Many long-distance trails have sections suitable for horse riding, and a few are suitable for horse riding throughout their length, or have been developed primarily for horse riding. The Bicentennial National Trail (BNT) in Australia is the longest marked multi-use trail in the world, stretching 5,330 kilometres (3,310 mi) from Cooktown, Queensland, through New South Wales to Healesville, Victoria. This non-motorised trail runs the length of the rugged Great Dividing Range through national parks and private property and alongside wilderness areas. One of the objectives was to develop a trail that linked up the brumby tracks, mustering and stock routes along the Great Dividing Range, thus allowing one legally to ride the routes of stockmen and drovers who once travelled these areas with pack horses. The Bicentennial National Trail is suitable for self-reliant horse riders, fit walkers and mountain bike riders. In the United Kingdom, the British Horse Society is developing a network of horse trails known as the National Bridleroute Network. A number of long-distance multi-use trails have been created in England, including three National Trails: the Pennine Bridleway, 192 km (119 miles), The Ridgeway, 139 km (86 miles), and the South Downs Way, 160 km (99 miles). In the USA the 27-mile (43 km) Cheshire Rail Trail, in New Hampshire, can be used by hikers, horseback riders, snowmobilers, cross-country skiers, cyclists, or even dogsledders. In Canada, following the abandonment of the Prince Edward Island Railway in 1989, the government of Prince Edward Island purchased the right-of-way to the entire railway system. The Confederation Trail was developed as a tip-to-tip walking and cycling gravel rail trail which doubles as a monitored and groomed snowmobile trail during the winter months, operated by the PEI Snowmobile Association. Many cyclists, horse riders and walkers undertake journeys on roads and ground that is not designated as trails. Long-distance cycling is usually documented in post-journey accounts. Long-distance horse riding is also known as endurance riding. Long-distance camel journeys are also well documented. Long-distance walks are documented by individuals who write accounts after the walks, and studies of the effects. Alan Booth, The Roads to Sata: A Two-Thousand-Mile Walk Through Japan (1985). Patrick Leigh Fermor, A Time of Gifts (1977), Between the Woods and the Water (1986), and The Broken Road (2013); describes a walk across Europe in the 1930s. John Hillaby Journey to the Jade Sea (1964); an account of an African walking tour using camels as pack animals. Journey through Britain (1968). From Land's End to John o' Groats. Journey to the Gods (1991); describes a tour through the mountains of Greece. George Meegan, The Longest Walk – Odyssey of the Human Spirit (1988); describes an unbroken walk from Tierra del Fuego at the southernmost tip of South America to the northern coast of Alaska at Prudhoe Bay between 1977 and 1983. Rory Stewart, The Places in Between (2006); recounts a walk across Afghanistan in 2002, after the Russians had left. Laurie Lee, As I Walked Out One Midsummer Morning; an account of Lee walking from his family home in the Cotswolds to London, and then across Spain before the outbreak of the Spanish Civil War. Freedom Trail (South Africa). A mountain bike trail. Long Distance Walkers Association, UK. ^ Mueser, Roland (1997). Long-Distance Hiking: Lessons from the Appalachian Trail. McGraw-Hill Professional. pp. 1–5. ISBN 0-07-044458-7. Retrieved 2009-09-12. ^ "Path Repair Techniques". www.fixthefells.co.uk. Retrieved 22 August 2018. ^ "Out in the country". Natural England. 29 November 2007. Retrieved 21 January 2019. ^ Lusmore, Melinda. "Walking the coast of Brittany". I Love Walking in France. Retrieved 21 January 2019. ^ "Official site". California Coastal Trail. Retrieved 15 February 2017. ^ "World's longest coastal footpath one step closer". Gov.uk. Natural England and Department for Environment, Food & Rural Affairs. 1 September 2017. ^ "The Iron Curtain Trail – experiencing the history of Europe's division". Iron Curtain Trail website. Retrieved 11 December 2013. ^ "EuroVelo 13 – Iron Curtain Trail". EuroVelo.com. European Cyclists' Federation. Retrieved 12 December 2013. ^ "TransPanamá – Uniendo las Américas". www.transpanama.org. Retrieved 3 April 2018. ^ "Wandern auf der Via Alpina – Wilkommen". via-alpina.org. Retrieved 3 April 2018. ^ "KashmirTreks". KashmirTreks.in. Retrieved 2014-05-15. ^ "Greater Patagonian Trail – Wikiexplora". www.wikiexplora.com. Retrieved 3 April 2018. ^ "Bushwalking – Bicentennial National Trail". www.john.chapman.name. Retrieved 3 April 2018. ^ "Home – British Horse Society". www.ride-uk.org.uk. Retrieved 3 April 2018. 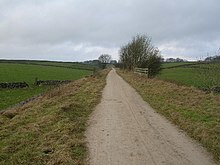 ^ Ride-UK: National Bridle Route Network provides details of other long distance bridle routes at http://www.ride-uk.org.uk. This page was last edited on 9 April 2019, at 10:42 (UTC).